The Oracle Turret is a friendly Sentry Turret that is encountered twice in Portal 2. Although the Oracle Turret is never named in-game, the name was revealed in an interview with Valve writers. 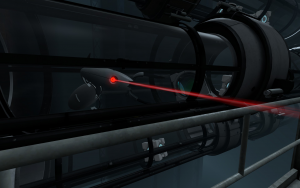 The player first encounters the Oracle Turret in Chapter 1 of Portal 2, where the Oracle Turret is stuck in a pneumatic transport tube. 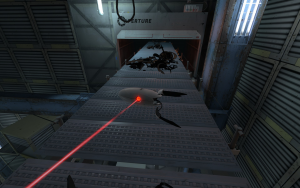 The Oracle Turret asks Chell to help it, and to take it with her; however the Oracle Turret is inaccessible and Wheatley advises Chell to move past and ignore it. The second encounter with the Oracle Turret is on the Turret Redemption Line. The player can pick the turret up from the Turret Redemption Line, at which point it says "Thank you" and an achievement(No Hard Feelings) is unlocked for saving it. After being saved, the Oracle Turret will say several cryptic messages, including "Her name is Caroline" and "Don't make lemonade". If the player ignores it, the Oracle Turret will complete its journey along the Redemption Line and disappear, and will presumably be incinerated and destroyed. Get Mad: Cave Johnson is angry in Chapter 7 about "lemonade" and says that. Don't make lemonade: Same reference as "Get Mad." Prometheus was punished by the gods by giving the gift of knowledge to man. He was cast into the bowels of the earth and pecked by birds: GLaDOS told Wheatley that he was designed to be a moron, which triggered Wheatley to send Chell and GLaDOS into Old Aperture unintentionally. After GLaDOS and Chell went down on the fall, GLaDOS was pecked by a bird and the bird flew away. Her name is Caroline; Remember that: Caroline, the assistant of Cave Johnson, is the person whose sentience resides in GLaDOS. That's all I can say: The last quote played by the Oracle Turret until picked up again. ↑ Valve On Portal 2: Spoiler Interview Part One, John Walker, rockpapershotgun.com, April 27, 2011. Accessed April 30, 2011. (Wikipedia)Crow T. Robot "I'm Different"
This page was last modified on 2 April 2019, at 17:19.